I came across this article and thought you would find it interesting to see how much forgery is going on around the United States.This woman was the wife of a popular radio host… forgery isn’t just a crime of poor people writing fake checks at the grocery store. This was an elaborate scam. 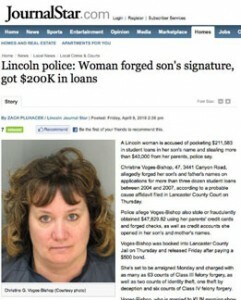 The Lincoln woman is accused of pocketing $211,583 in student loans in her son’s name and stealing more than $40,000 from her parents, police say. Christine Voges-Bishop, 47, 3441 Canyon Road, allegedly forged her son’s and father’s names on applications for more than three dozen student loans between 2004 and 2007, according to a probable cause affidavit filed in Lancaster County Court on Thursday. Police allege Voges-Bishop also stole or fraudulently obtained $47,829.82 using her parents’ credit cards and forged checks, as well as credit accounts she opened in her son’s and mother’s names. Voges-Bishop was booked into Lancaster County Jail on Thursday and released Friday after paying a $500 bond. She’s set to be arraigned Monday and charged with as many as 63 counts of Class III felony forgery, as well as two counts of identity theft, one theft by deception and six counts of Class IV felony forgery. Voges-Bishop, who is married to KLIN morning show host and program director John Bishop, told police her husband was not aware of the incidents. John Bishop has not been implicated, police said Friday. In December, Voges-Bishop’s parents discovered several unauthorized withdrawals from their Security First checking account, which Voges-Bishop made by adding herself as a user on their online account, the affidavit alleges. After calling police, Voges-Bishop’s father discovered 43 student loans taken out at Sallie Mae and American Education Services, for which he was listed as a co-signer and Voges-Bishop’s son as the borrower. Investigator Mayde McGuire of the Lincoln Police Department’s Technical Investigations Unit called Voges-Bishop and determined she had forged her son’s and father’s signatures on the loan applications, the affidavit says. During the investigation, police also found Voges-Bishop allegedly forged $4,900 in Security First checks while her parents were on vacation in summer 2009, and $35,000 in Chase and Bank of America checks in 2006 and 2007, according to McGuire’s affidavit. Voges-Bishop also opened two CitiBank accounts, one in her son’s name and the other in her mom’s, McGuire alleges. Charges on those two accounts totaled $8,629.82, according to the affidavit. The account under her son’s name had been sent to collections, and a civil suit was filed against him in Lancaster County District Court in 2009. Voges-Bishop could not be reached Friday afternoon.